Our Team was founded on the belief that the knowledge of many is always better than the knowledge of one. We are committed to bring our clients the cumulative knowledge and experience of our entire team. 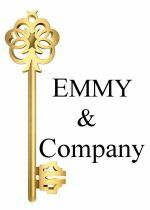 We strive to be "Your Key To Creative Real Estate Solutions" Stagers, E-Pros, Real Estate Consultants, Luxury Home Marketing Specialists, Short Sale Specialists, Accredited Buyer Representatives and more. Each of us has unique qualities and experience that we share to benefit our clients and each other. The members of our team know each property that we list. Someone with firsthand knowledge of your property is always available to answer question that potential buyers may have. We meet weekly to discuss new strategies to get properties sold, and find our buyers the right home. With this in mind you can relax in knowing that you are always well represented. We will work to accomplish your goals and earn your trust and referrals. Give us a call to discuss the many options available to you today. Personally Emmy Sarica's background is For 18 years I owned my own a very successful Retail Store in Fairfield and Westport, during that time and afterwards I was a marketing consultant and productivity coach for both small and corporate retail businesses, helping to conceptualize new businesses and improve profits in existing ones. I've designed several retail spaces and homes, with a focus on functionality...basically, I'm a problem solver, and even in this difficult market...I see endless possibilities. In my search for something new...Real Estate was a natural choice. I was able to use my marketing experience to find inovative way to sell homes...My design knowledge to help buyers see a home's possibilities. My consulting background enables me to sift through endless possibilities to find the best solutions. I've been a realtor for 11 years and I've often been told that my methods are different and "Real". After hearing a few clients tell me that, I put the 'real' in Real Estate, I've adopted it as my slogan and my goal. My name is Emmy Sarica, I'm a Real Estate Consultant...and "I put the 'Real' in Real Estate.